Tom Hoehn - Console Up! So. 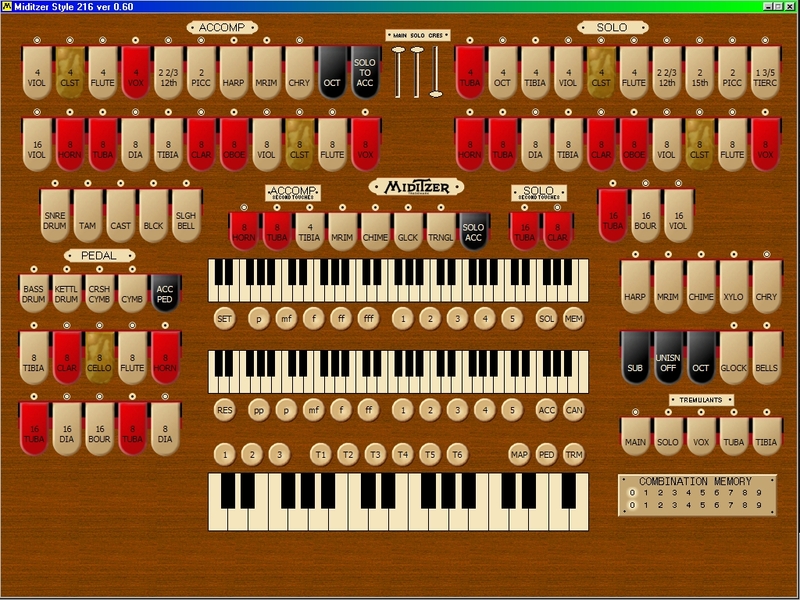 You want to play the mighty WurliTzer for the first time and there it is with scores of switches and buttons. What does all this stuff do and how can you use it to make great music? Read on, fellow students. The answers are below. On a WurliTzer TPO, the stops are arranged according to the PITCH/POWER rule. Lowest Pitched and LOUDEST on the left getting progressively higher pitched and softer as you move from left to right. Barton organs were usually arranged the same way. Look at the layout of the MidiTzer stops in the screenshot above, or even better, the program running on a monitor. If you disregard the 16' short row on the right side, the first 8' stop on the SOLO is the Post Horn 8' which is the LOUDEST STOP ON THE ORGAN, followed by the Tuba, then Diapason and then Tibia, with each stop getting progressively softer until you arrive at the loudest 4' stop, 4' TUBA. It isn't unusual to find quiet color reeds like the Vox Humana interspersed within the strings and flutes. On Möller Theatre Organ consoles like the one at the Fox Theatre in Atlanta, Georgea, the layout was really quite interesting. Looking at the Center of the stop rail you saw 16' stops. As you moved around to either side, the stops got higher pitched and softer. So what normally would be on the LEFT EDGE of the LOWEST BOLSTER (32' or 16' Diaphone) was actually in the center of the rail. Everything progressed by pitch and power but from the center out instead of from LEFT to RIGHT. I just learned that our public museum is holding a concert for its season-ticket holders, which will feature an "open console" at its 3/30 Wurlitzer. My wife and I are tempted to spring for the tickets and attend as many concerts as possible, including this one. My question is, how should we behave at an open console? Do people play just one song and get off? Can we have more than one turn? How do I know when it's my turn? Obviously I've never done this before and I'd like to do it well. Can someone please toss me a clue? When our chapter has open console, we have a sign up sheet. I don't know how many songs they will let you play, with our chapter it depends on how much time we have at the location. There are still great minds in the Land of the King who are more than willing to tell us the finer points of playing the Mighty Theatre Pipe Organ. I shall share with you below the wisdom I have greaned from them. What did they DO on the organ when stuff happened on screens back then? What about choo-choo trains or airplanes or pies in faces or people kissing or cat's meows or cows mooing or cuckoos cuckooing or laughter or ... well, you get my drift. I can understand traps for thunder or boat whistles or sirens and stuff, but what about general sounds? What did the organist actually PLAY to give some kind of sonic interpretation to the scenes? I have seen folks use two methods. First, and preferred in my opinion, is to select a theme for each major character, and use it whenever that character is the focus of a scene. Obviously, the themes can be played in many styles to fit the scene: bright for a happy scene, maudlin for a sad scene, minor for danger, etc. The second, better used for comedies and other lighter fare is to play music appropriate to the scene. Sound effects lose their effectiveness if overdone. If the scene depicts a thunderstorm, DO NOT overwork the thunder pedal! Likewise, a bird call can be quite effective in a funny scene, or useful if a character is 'bonked on the bean', but don't use it constantly. Less IS more! I have seen films scored by Gaylord Carter, Ann Leaf, George Wright, Lee Erwin, and many younger players, most notably Chris Eliot and John Fenstermaker. Of these, most used the first method. Most of them did quite an effective job. Gaylord Carter told his audiences that his job was to make the movie stand out so that you (the audience) would FORGET that someone was playing, and just watch the movie. One of the more interesting jobs I saw was a film accompanied by Ann Leaf (San Francisco Paramount, 1964), who's copy of her intended film didn't arrive, and who played a film she borrowed from a local film collector, and probably hadn't seen in 40 or so years, COLD. It arrived at the theatre in time to be loaded and run, and she did a masterful job, using the second method. George Wright was not so effective. He was a fine soloist, and a masterful radio organist, but his accompaniment of a Ben Turpin comedy was less than inspiring. This was done, by the way, back in 1958 or '59 at the San Francisco Fox Theatre, and I noted that he never did that again, at least not in the Bay area. Lee Erwin was perhaps the most interesting as he COMPOSED all of the music he played. No royalties that way, was his reason. The others mentioned always did their homework, and provided music well suited to the subject. John Fenstermaker's use of French music for the "Phantom of the Opera" was a wonderful musical education in itself! A friend downloaded a free book called THEATRE ORGANIST'S SECRETS: A Collection of Successful Imitations, Tricks and Effects for Motion Picture Accompaniment on the Pipe Organ, compiled and published by C. Roy Carter. It is a great reference for the budding cinema organist as well as the seasoned pro. He has several books of this type, and there a great ideas in all of them. More questions were asked by Paul. 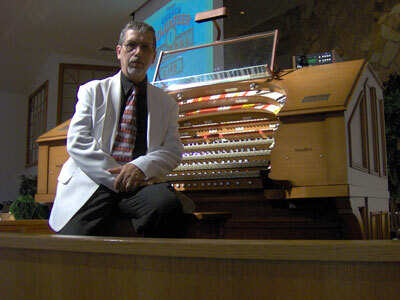 Do most silent movie organists simply play tunes? (1) Is there a way to use the organ for non-musical ambience or sound effects without awkward or klutzy disservice to the instrument? (2) Is there a protocol for using classic themes to establish a sort of leitmotiv for cinema accompaniment? (3) What sort of techniques are there to provide musical support and yet liberate the organ from the stereotypical soap opera sound? (1) Playing WELL is the best service you can give to the organ. Playing POORLY leads to the "awkward" or the "klutzy". Less is more. A single well-timed effect can be the most effective of all. (2) I wouldn't call it a protocol, but the use of themes, as discussed above, is a great way to go.